Parts Used: Leaves & Pods – fresh and dried. The sennosides irritate the lining of the large intestine causing the muscles to contract strongly resulting in bowel movement approximately 10 hours after the dose is taken. The sennosides also stop the fluid from being absorbed from the large bowel helping to keep the stool soft. Avoid in cases of spastic constipaton and colitis. Do not take when haemorrhoids are present or when the alimentary tract is inflamed. Should not be used during pregnancy or breast feeding. Nursing mothers who take laxatives pass this on to the baby through their breast milk. Harmless in low doses however in sensitive individuals can cause griping pains, voilent diarrhoea and even dehydration. Prolonged use can lead to colonic problems. 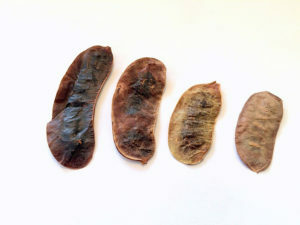 Due to the colouration of the pods, a red colour may be observed in the urine.